Mountains have always been a home away from home for me. After doing Everest Base Camp and other smaller treks, I thought it was time to attempt the daunting Chadar trek in the Indian state of Jammu and Kashmir. I went on the famed trek along with four of my friends from Hyderabad: Usha, Satya, Krishna, and Soumya. Once we reached Leh and Ladakh, we started with a three-day acclimatisation process and medical procedures, where we shopped for clothes to keep us warm during the trek. After a three-hour bus drive, we reached our starting point. The first step on Chadar was terrifying as I felt the thin layer of glasslike ice crack under my uncomfortable gumboots. We learned the ‘penguin walk’, got used to the sounds of Chadar, and had faith she wouldn’t drop us. We arrived at our first camp early while we were still getting used to the weather and walking on ice. When we reached our set camp, our porters greeted us with a smile and served us hot tea and biscuits, followed by a hot lunch. Throughout our journey, the porters were helpful; they reached early to set up the camp and served us hot and fresh food. Each day passed with sub-zero temperatures, while the porters acted as our morning alarm, waking us with tea. 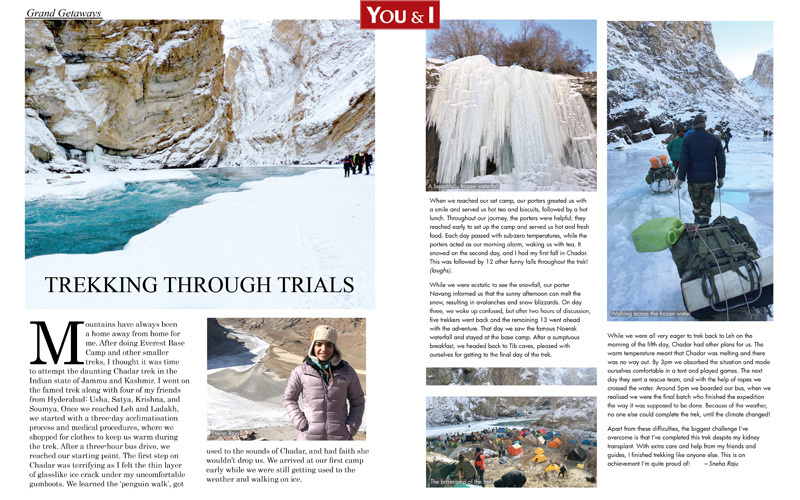 It snowed on the second day, and I had my first fall in Chadar. This was followed by 12 other funny falls throughout the trek! (laughs). While we were ecstatic to see the snowfall, our porter Navang informed us that the sunny afternoon can melt the snow, resulting in avalanches and snow blizzards. On day three, we woke up confused, but after two hours of discussion, five trekkers went back and the remaining 13 went ahead with the adventure. That day we saw the famous Naerak waterfall and stayed at the base camp. After a sumptuous breakfast, we headed back to Tib caves, pleased with ourselves for getting to the final day of the trek. While we were all very eager to trek back to Leh on the morning of the fifth day, Chadar had other plans for us. The warm temperature meant that Chadar was melting and there was no way out. By 3pm we absorbed the situation and made ourselves comfortable in a tent and played games. The next day they sent a rescue team, and with the help of ropes we crossed the water. Around 5pm we boarded our bus, when we realised we were the final batch who finished the expedition the way it was supposed to be done. Because of the weather, no one else could complete the trek, until the climate changed! Apart from these difficulties, the biggest challenge I’ve overcome is that I’ve completed this trek despite my kidney transplant. With extra care and help from my friends and guides, I finished trekking like anyone else. This is an achievement I’m quite proud of!